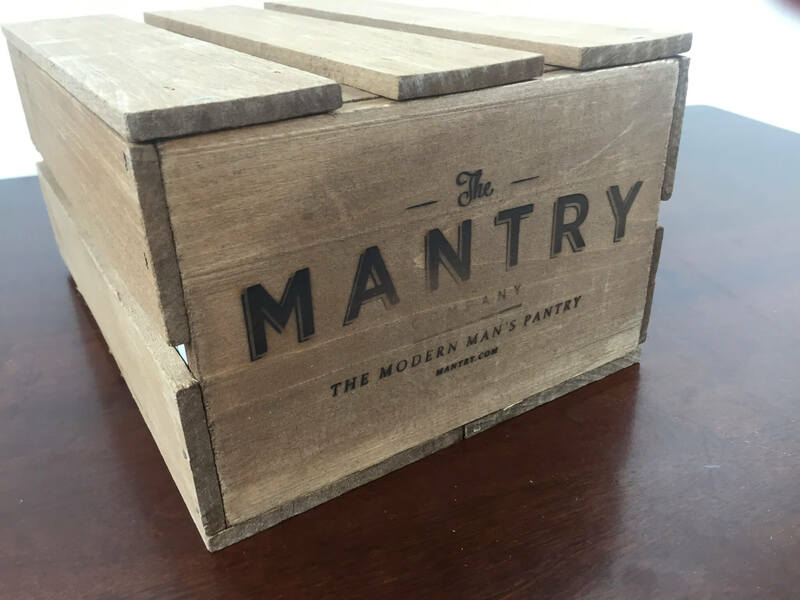 Mantry is “the modern man’s pantry” in a bimonthly subscription box. 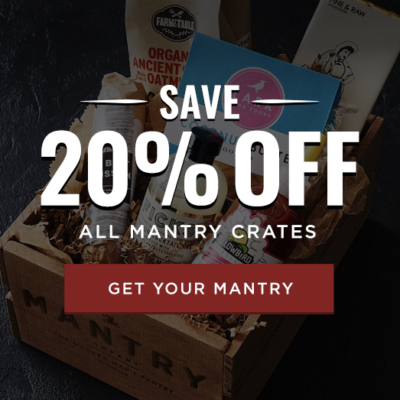 They scour the US for the best artisan foods, and curate them into man-friendly themes, sending 5-6 full size super premium products every month, curated just for manly taste. 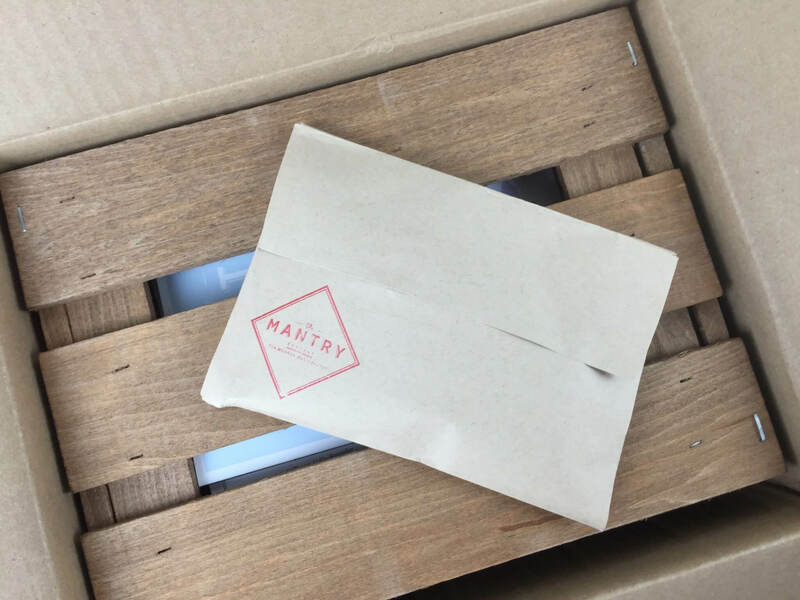 Recently they decreased their price from $75 to $49, and the box now arrives bimonthly. Your first box includes a fabulous wooden crate, plus a welcome kit! 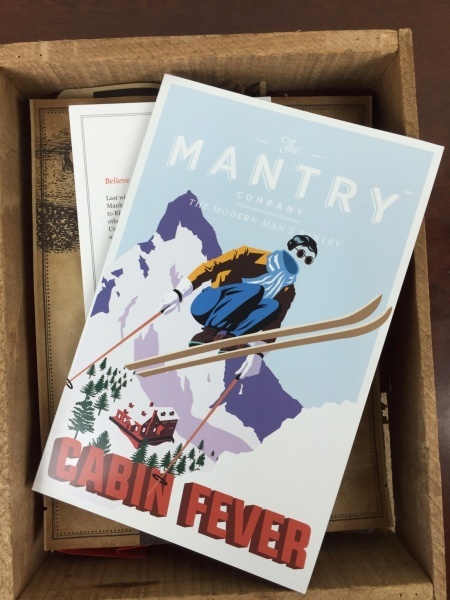 This is a review of the March 2016 Mantry – see the contents of the welcome kit here! The wooden crate is really cool. It’s a fun way to keep your Mantry items out of the general population in the pantry, plus it is nice enough looking to make an awesome decorative item. The bi-monthly theme is Cabin Fever, celebrating the tail end of winter. 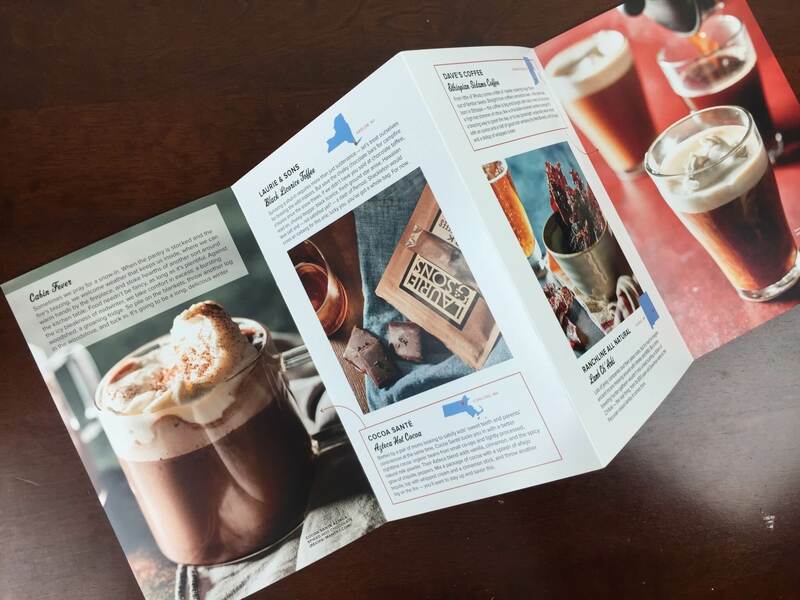 The accordion-style booklet details the origins and particularly noteworthy characteristics of each item in the carefully curated box. 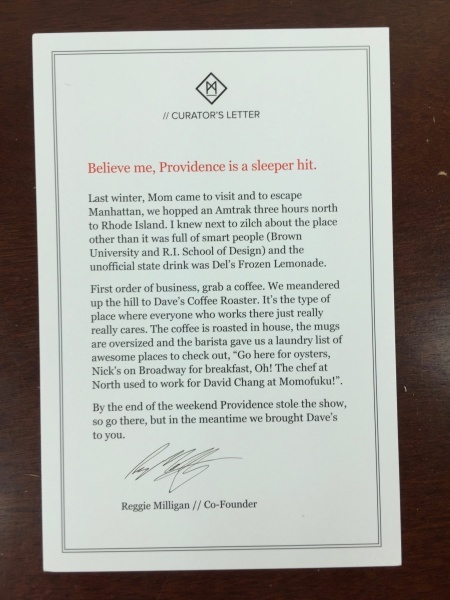 The Curator’s Note reports on a recent trip to Providence, where he discovered the great coffee selected for the box. 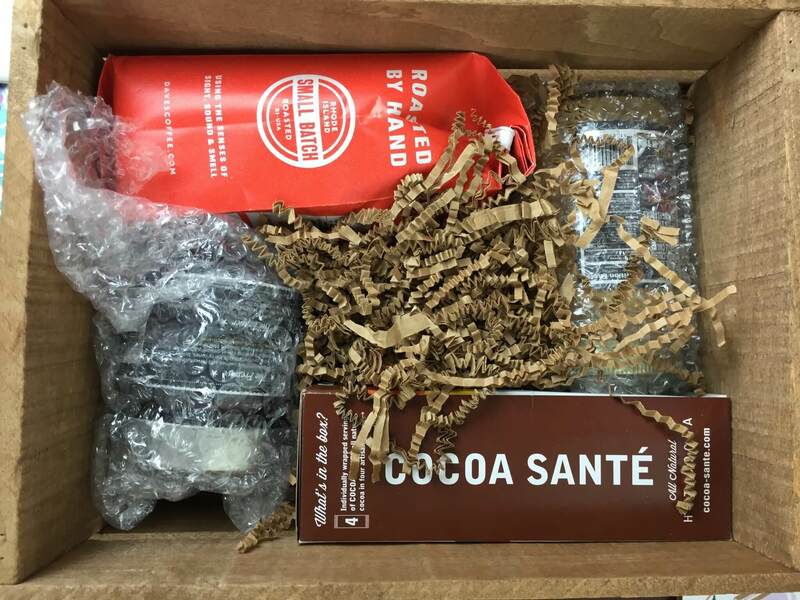 The contents are packed snugly with squiggles — the jars are given some extra protection with bubble wrap. 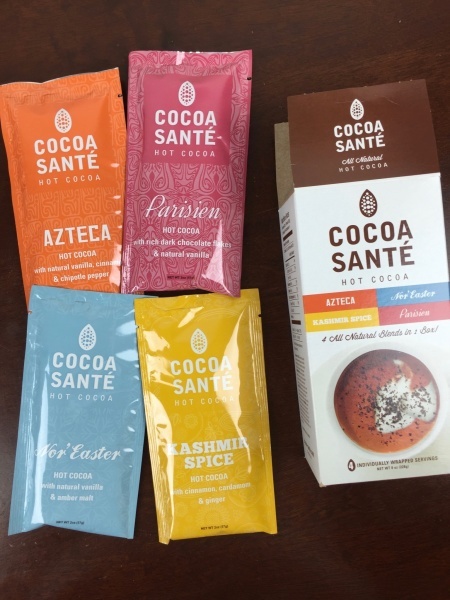 Cocoa Sante Hot Chocolate ($8): This sampler takes cocoa up a notch, adding crave-worthy flavor accents to high-quality cocoa. The four-pack features a spicy cinnamon-chipotle Mexican style Azteca, a rich, dark Parisien, a malted Nor’Easter, and a chai-like Kashmir Spice variety. Brandy laid claim on the entire set immediately, although deigned to let me keep the malted chocolate. 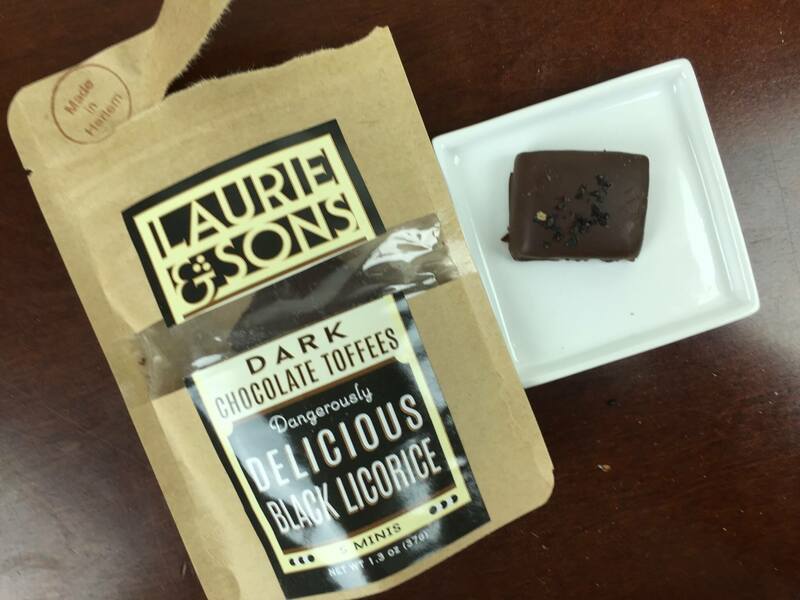 Laurie & Sons Black Licorice Toffee ($6): The black licorice is notably intense when eating a single piece, but it becomes very subtle if you go back for second (or third) piece. The licorice is a nice accent, but these crunchy toffees are most notable for their wonderful texture and complex flavor, as well as the lovely dark chocolate that smothers them. Dave’s Coffee Ethiopian Sidamo Coffee ($11.95): These beans are carefully roasted on-site at Dave’s Coffee in Providence. 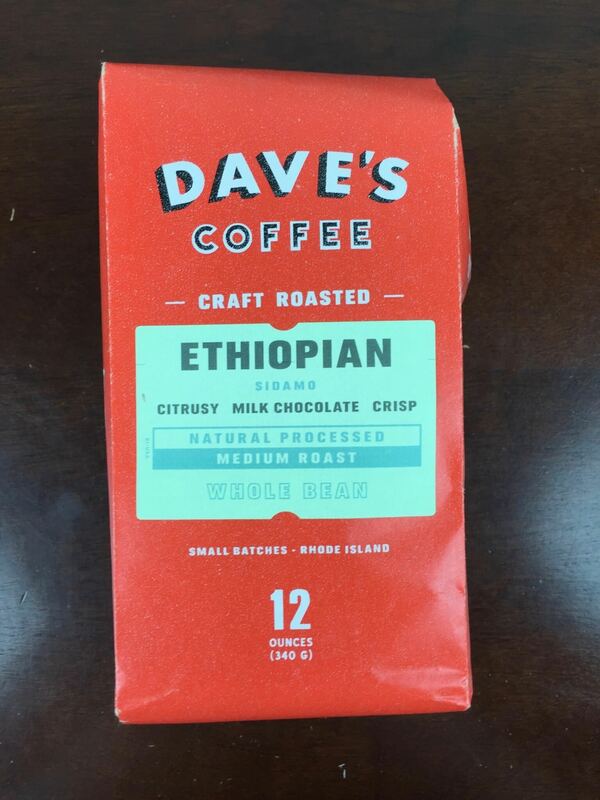 The natural processing means these beans sit with much of their pulp attached during curing, developing the unique floral, citrus, tangy notes for which Ethiopian coffee is famous. Eliot’s Adult Nut Butters Honey Chipotle Peanut Butter ($8.99): This peanut butter has a loose consistency, but it is replete with tiny chunks of peanut. It has just enough honey to balance the slightly smoky chipotle flavor. 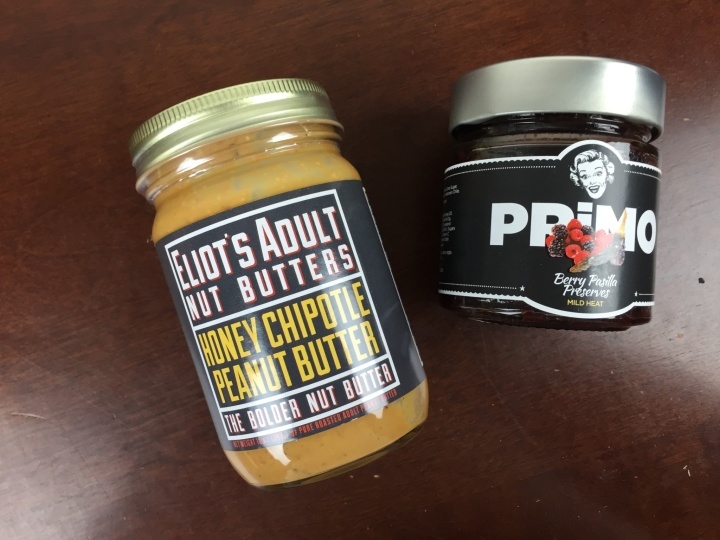 THis is really tasty and just a bit spicy — it’s great for dipping pretzel sticks or mixing with the Primo for the best PB&J imaginable. Primo Specialty Foods Berry Pasilla Jam ($9): Whereas the PB was smoky and deep, this jam has a bright, sweet flavor that brings a nice level of heat. The pasilla really complements the berry flavors — this is actually extremely delicious and not merely a novelty. 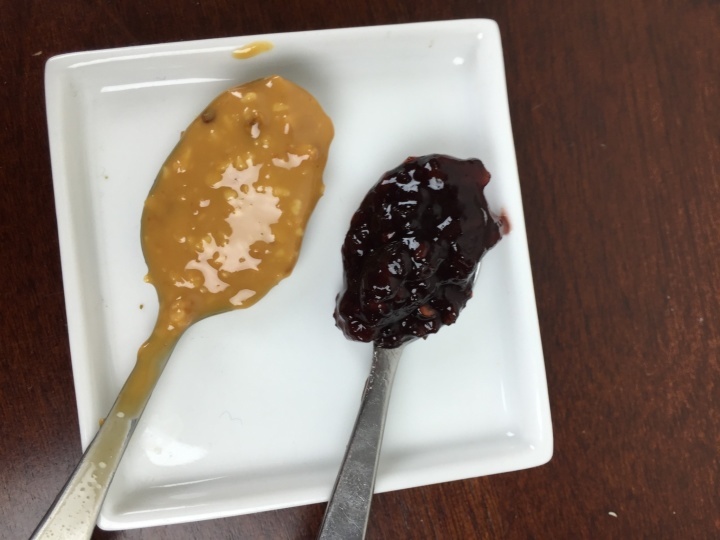 The peanut butter is fairly saucy with bits of unground peanut, and the jam is full of berry chunks. Ranchline All Natural Lamb Ch’Arki ($6.99): The seasoning on this jerky is very light — it gets its unique taste from the lamb itself. 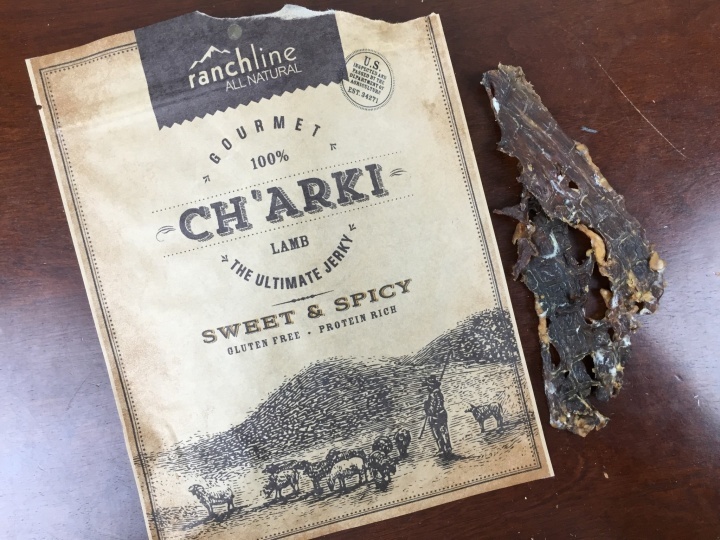 Greasy, fatty, lamby, and a bit tough, this jerky is for lamb lovers. It has the distinct taste of lamb and revels in its preservation of the flavorful fat found in the meat. 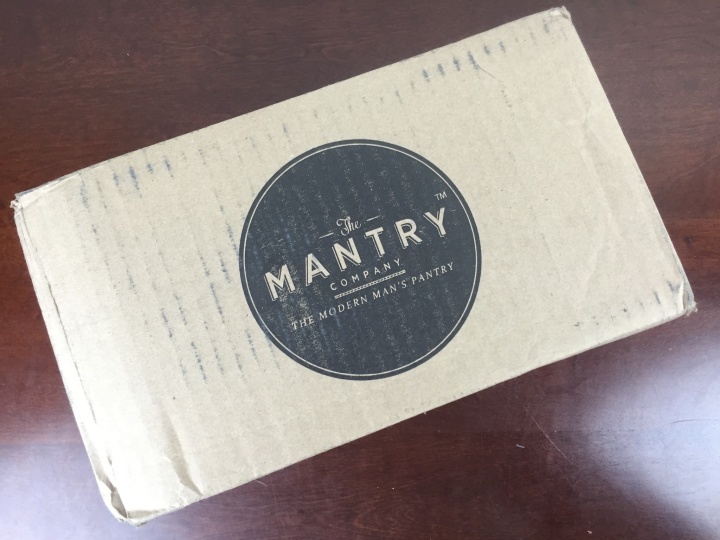 Mantry’s new format looks to serve it well, and I love the recent downward adjustment to the price point! The products are still of superb quality and exhibit great curation, but limiting the crate to the first box only has allowed them to offer a much more reasonable subscription price. 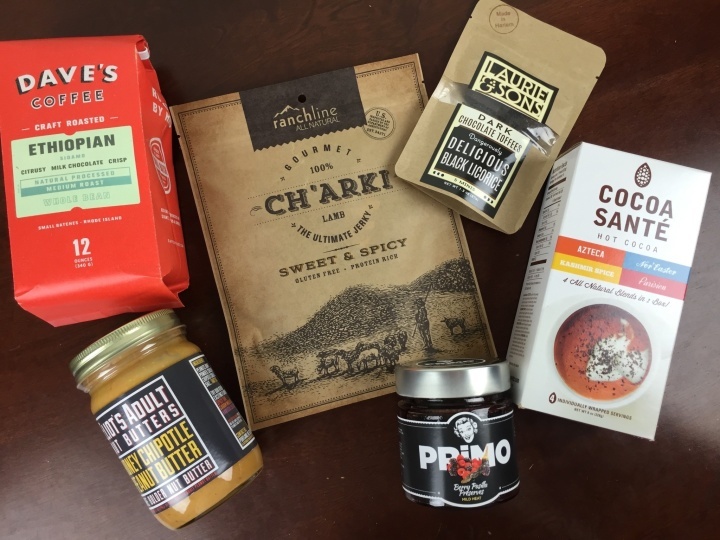 My favorites from this box were the PB&J (the best spiced versions of these I’ve had), and the subtle and delicious toffee. 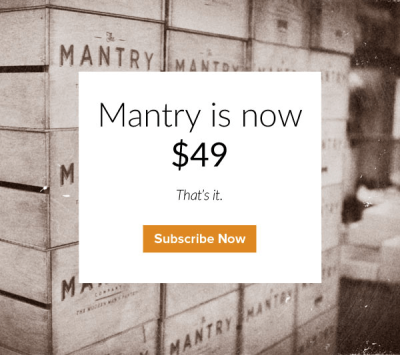 Visit Mantry to subscribe or find out more! The Description: The Modern man’s pantry for food items. 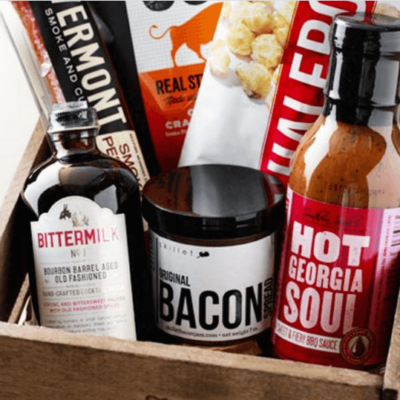 Receive 5-6 full-size super premium foods from around America in a premium wooden crate. See Mantry in the Hello Subscription Box Directory! 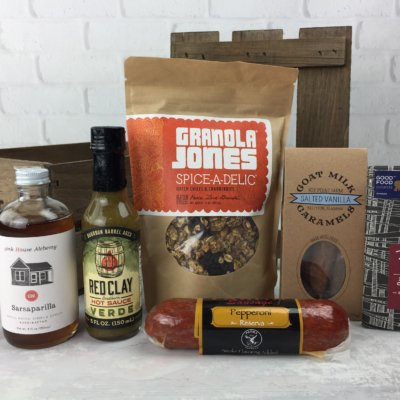 The Categories: Food & Cooking Subscription Boxes, Men’s Lifestyle Subscription Boxes, Subscription Boxes for Men. 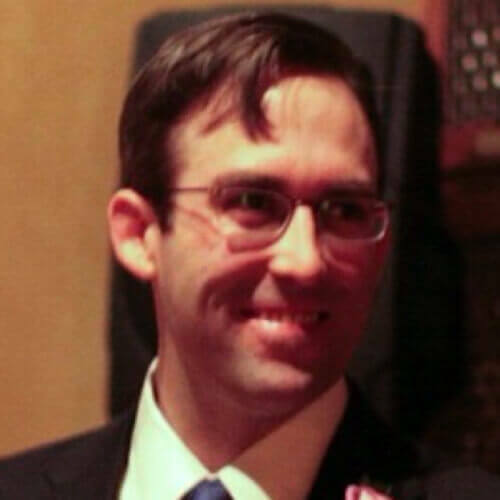 The Reviews: See all our Mantry Reviews.